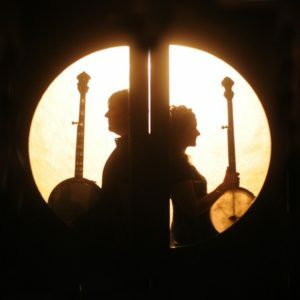 Béla Fleck and Abigail Washburn bring all the banjo you can handle to Des Moines on Saturday, Feb. 17 at Hoyt Sherman Place. The husband and wife duo have been dubbed the “the king and queen of banjo” by Paste Magazine, and have even won a Grammy together for their efforts. Fleck is best known for his work with Béla Fleck and the Flecktones, the band celebrates 30 years in 2018, and in honor of the occasion will be touring once again this summer. When contemplating the best banjo players of all time, Béla Fleck is always near the top — if not sitting atop — the list, what does it feel like to be known as one of the best at what you do? It’s a pretty good feeling, but it’s probably a trap — meant to distract me from the true ideals of playing music! Playing music keeps you humble — it’s a moving target, and there are a lot of great players, historically and up and coming. What is your favorite thing about the banjo? What drew you to it and has kept you so captivated? Having a great sounding banjo in my lap and playing it still makes my day. The basic sound that Earl Scruggs pioneered still turns me on. Similarly, what does it feel like to bring such notoriety to the banjo? Especially being that your name is synonymous with the instrument. It’s good to remind people what a fascinating instrument the banjo is, and the history — most notably the African slave origin is oft overlooked. I enjoy being a spokesperson. You have played with celebrity banjo enthusiast Steve Martin on a couple of occasions, what do you think of his banjo skills? He is a gifted musician; very good at expressing who he is through his banjo. Your wife, Abigail Washburn, is also an accomplished banjo player, who wins in a banjo duel? We don’t duel, but if we did she would surely win. What is it like working so closely with your partner (multiple albums, touring, etc.)? It’s one of the great moments in my life, honestly. As much as I have toured over the years, it’s brand new and amazing to share the experience with my talented partner, and our 4 and a half year old child. This is truly unexpected. By the way, and it will hard not to notice by the time we get to you, we are expecting our second child in June. You and Abigail won the Grammy for “Best Folk Album” in 2016, how does it feel to win an award for a project with your partner (not something many couples can claim)? We’re both very gratified. We work hard at our music, and it is a very personal experience, for the reasons I described. Because of that, it’s hard not to take this Grammy personally… I have won several before, but this one really means a lot. With all the awards and accomplishments you have, what’s next for you in your banjo career?